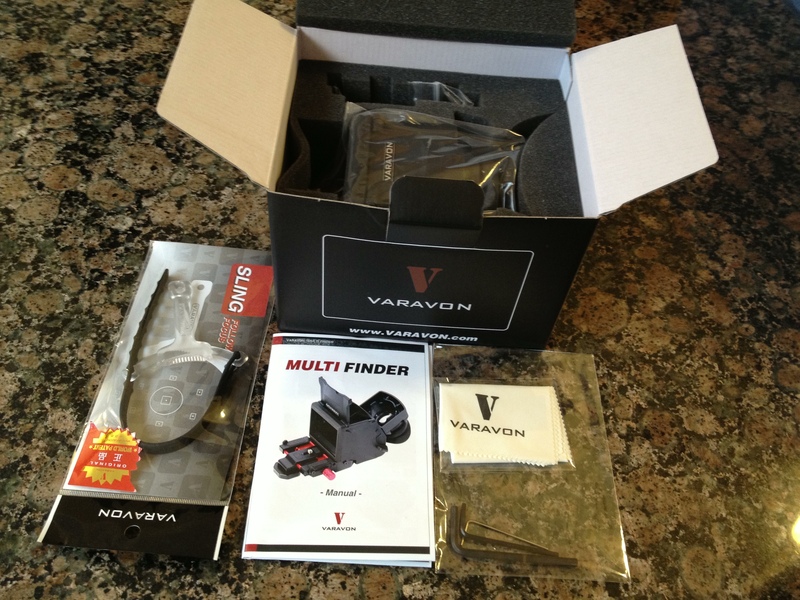 In this article I take a look at the VARAVON Multi Finder. Firstly, lets cover just a little background for those wondering why & when you’d use a multi finder/loupe. The LCD on the back of the most cameras is very difficult to see in bright sunshine. Despite the D7000 having a brightness adjustable LCD, you’ll still stuggle on very sunny days. Also, the LCD is fixed on the D7000. Some other competitive models and now in fact lower and higher range Nikon models have LCDs that can flip out and rotate. So if you want to shoot something very low down, the only way conventionally to see will be to get down to the camera’s height – which may even involve laying on the floor. This makes it extremely challenging at times, especially if you’re trying to direct a shot and organize people at the same time. So many photographers, especially those shooting video turn to loupe’s or multi finder loupes. These devices fit on the back of the camera, mostly via the tripod mount thread fixing point. The VARAVON Multi Finder is a finder with a removal loupe. This new version is considerably higher quality than the previous version – which is evident as soon as you take it out of the box. The packaging is sturdy and there’s plenty of thickness to surrounding black foam to ensure there’s no way this will be damaged in transit. 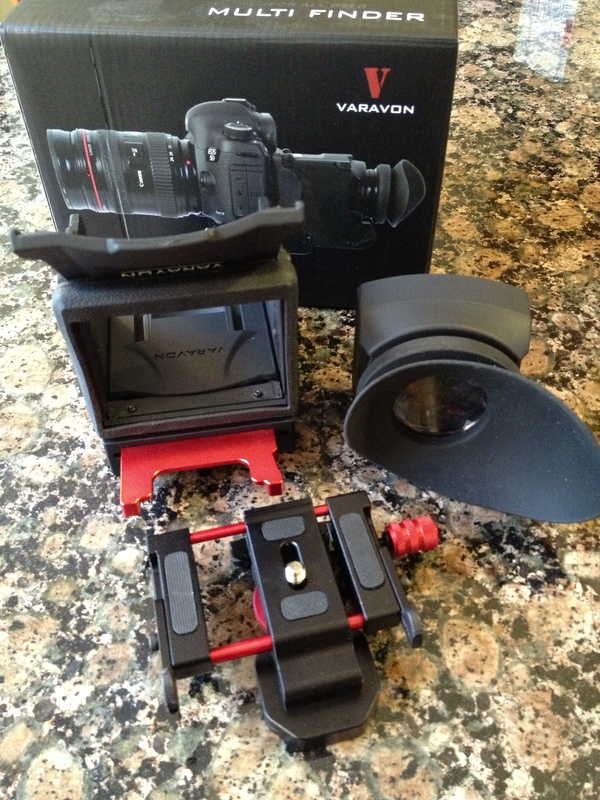 Supplied is in the box are; Multi Finder, loupe, an adjustable fixing plate, 3 allen keys, cleaning cloth, instructions and VARAVON threw in one of their Follow Focus slings for “good-luck”. The Multi Finder itself can be used with or without the loupe. 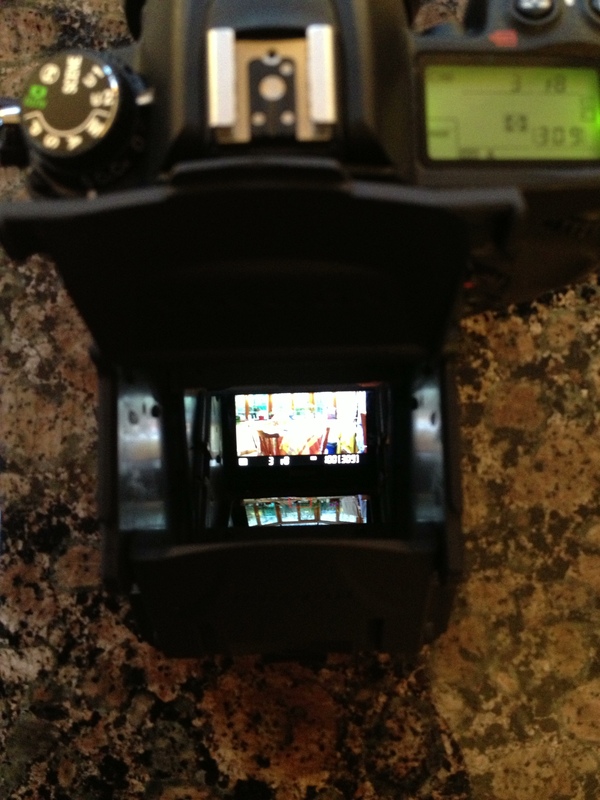 You can view through from the top (via two mirrors housed in the finder), or from the rear. Viewing from the rear (straight through) can be with or without the loupe. The loupe itself has an adjustable dioptre. Which is + or – 3. VARAVON market the Multi Finder for the 5DmarkIII, D800 and D4, but it will fit other cameras. It fits the D7000 – but only with fine adjustment. The reason is that the finder is designed for cameras with a 3.5″ LCD. The D7000’s LCD is 3″. 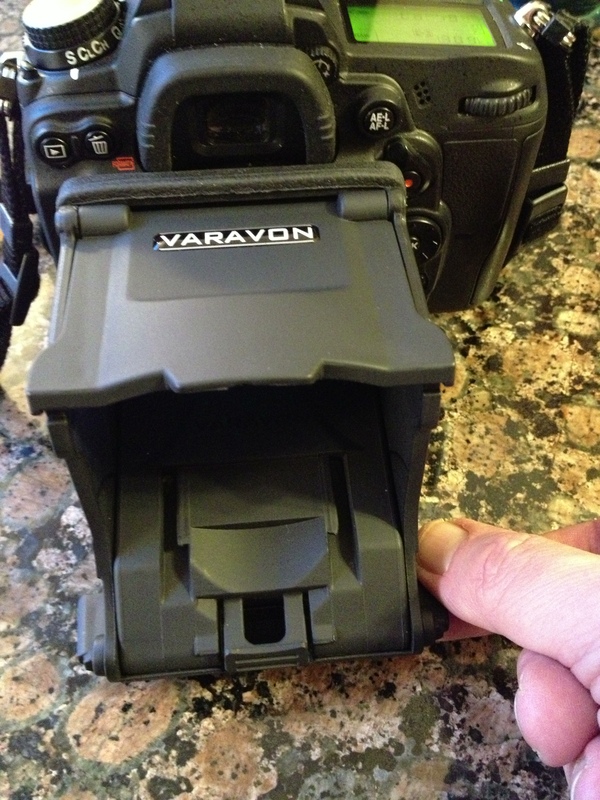 VARAVON’s Pro Finder may be slightly more suitable for the D7000 being designed for 3 inch LCDs. 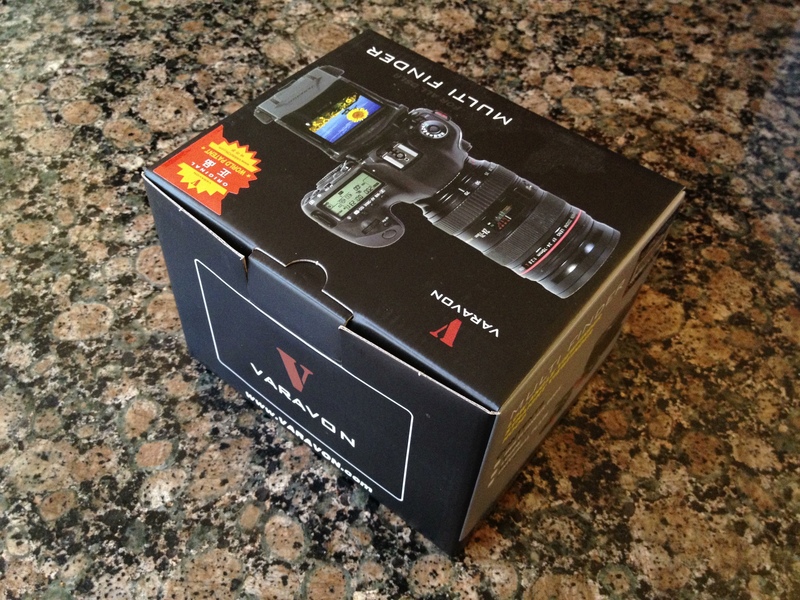 However, if there’s chance you might upgrade to a D800 or D4, this is a fine investment. When you first look over the parts, you see the quality straight away. 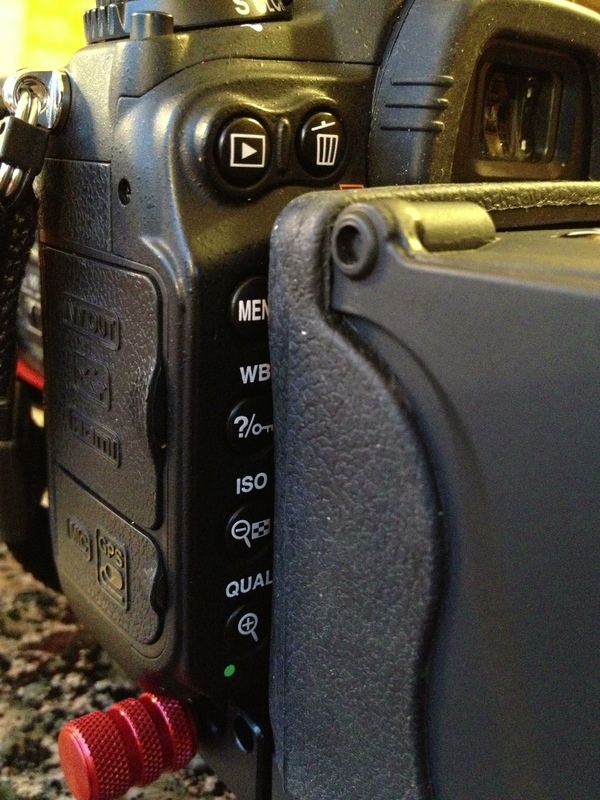 The front of the finder has rubber to ensure a tight contact and no scratching. The plastic is thicker and stronger on this model. It gives more or an air of professional kit. 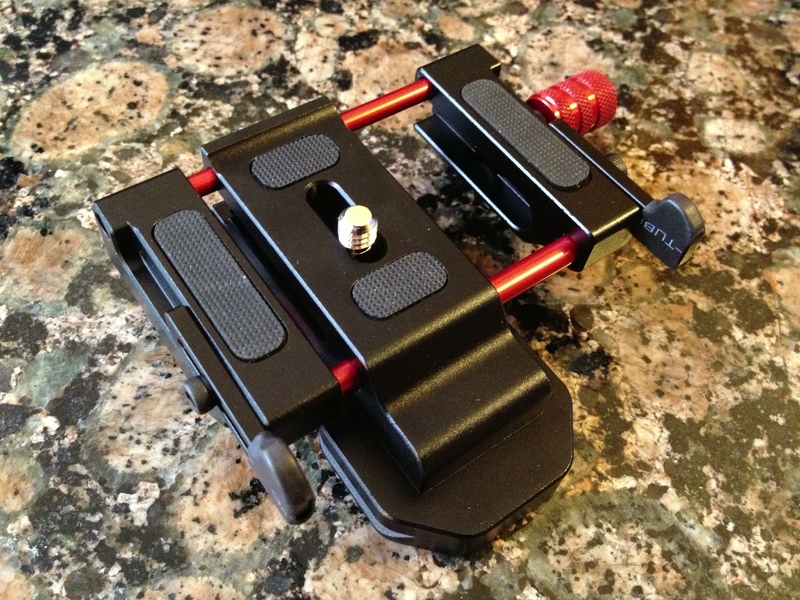 The universal plate is highly adjustable. 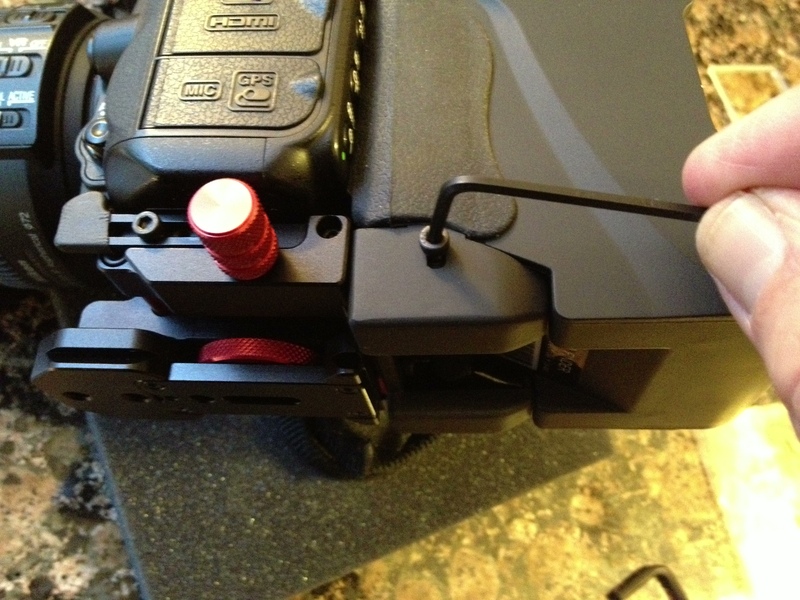 This enables the plate to be mounted to numerous cameras. The 1/4 inch bolt is threaded into the camera’s tripod mount. It’s tighted by a large red wheel. It’s the other side of this plate – you’re looking at the base here. The plate is sideways adjustable – it moves along the 2 narrow red metalic tubes. This enables central positioning on your LCD. The large red knob on the right hand side is used to lock the Multi Finder in place to the plate once you’ve fitted the plate to the camera and inserted the finder into position against the camera. If you’ve got a Nikon BM-11 LCD cover over your LCD, you’ll need to remove that. 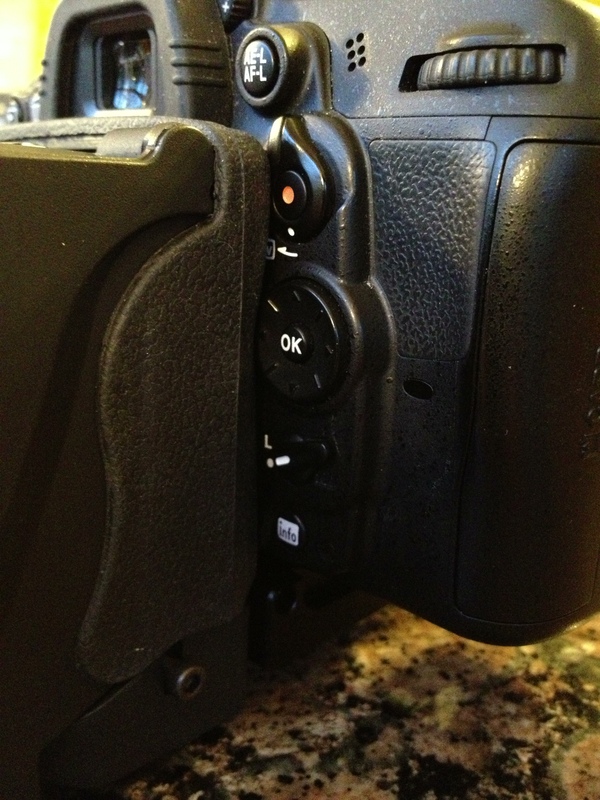 The Multi Finder won’t sit flush against the D7000’s LCD with that in place. 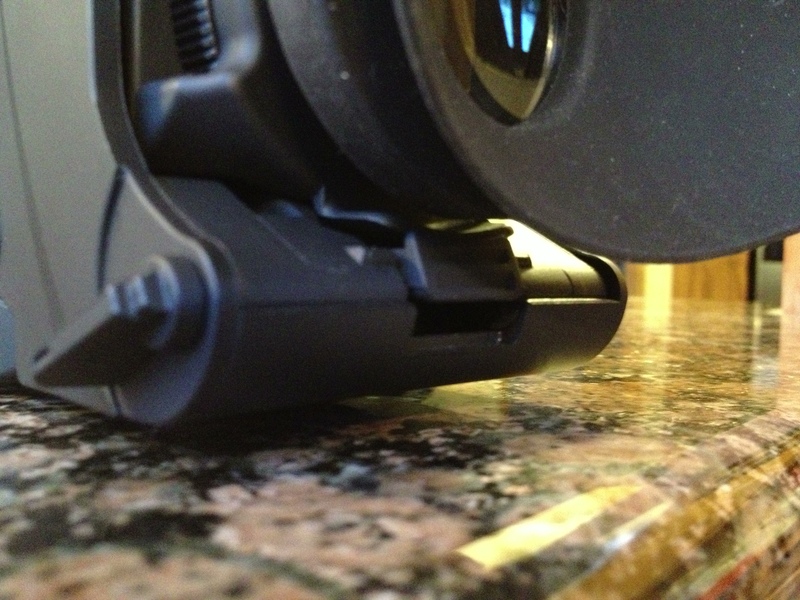 To the left you can see how the 1/4 inch bolt screws into the tripod mount on the base of the D7000. Twist the bolt just a couple of turns into the camera. Look at the back of the camera and align the centre of the plate with the centre of the LCD. To the right you can see the adjustable feet that need to be moved right next to the D7000’s body. They are grey and slide towards the front and back of the camera. They are locked in place by the allen key. You can see me tightening the allen key here since the foot is in place – chocked against the front of the camera body. The red wheel locking the plate in place shouldn’t be tightened fully until you’ve got it exactly in the right place. Fit the finder body to the plate, and push it tight against the back of the D7000. Ensure the plate is tight against the finder. Now the plate is correctly placed in terms of front/back placing. Check the rear alignment one last time. Now tighten the base red wheel fully to lock the plate in position. Now adjust the finder body height against the back of the D7000. The finder’s main body moves up and down on sliders attached to the base. 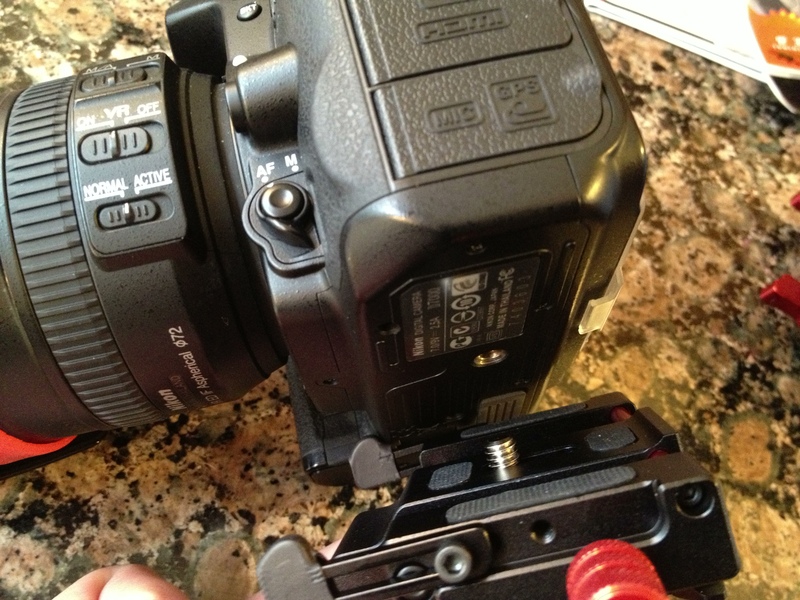 Once you have the height correct, tightent the allen screws both sides of the finder body base. In the photo to the left you can me tightening these screws. Once you’ve locked the height, you can now lock the finder to the plate. This is done by twisting the red knob on the left hand side of the plate. You can that to the right. This is ideal for low shooting situations, either on a tripod (preferred) or hand held. To set this up; pull up the top cover, and pull up the rear door and lock in place. This view utilizes the two inbuilt mirrors. These are excellent and utilize surface mirror technology to avoid any ghosting or blurring that occurs with cheaper mirrors. This is essential when you’re focussing. There is a technique to focussing. Firstly it depends if you’re in manual or automatic. Most times you should be in manual – which avoids focus hunting, microphone noise and more. You could always switch to automatic, focus, and then switch back – that’s one approach. Another is to zoom in, focus and zoom out. Remember that in Live View you only have one focus point, the red square. This can be moved using the D control. With the finder in place, you’ll struggle a bit to press the left hand side of the D though. You can use one of the allen keys though to press left. This is ideal for sunny days, when you want to hold the camera in front of you and shade the LCD. The “bulk” of the Multi Finder provides increased stability if your hand holding. 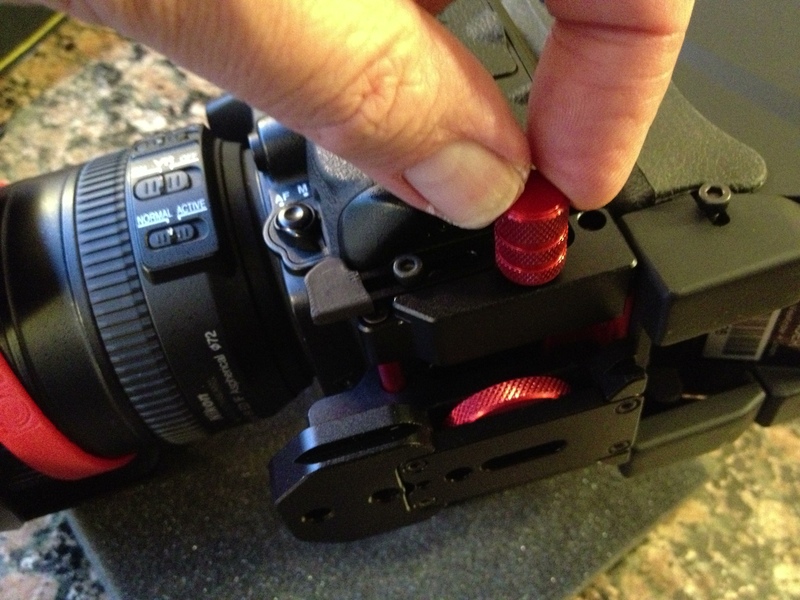 If not, the adjustable plate has a bolt hole for your tripod. Ensure you have a tripod that can bring the camera up to an easilty viewable height. The Multi Finder’s mirrors are not used here. You’re looking direct at the LCD. The shot RHS shows how the read door is lowered. 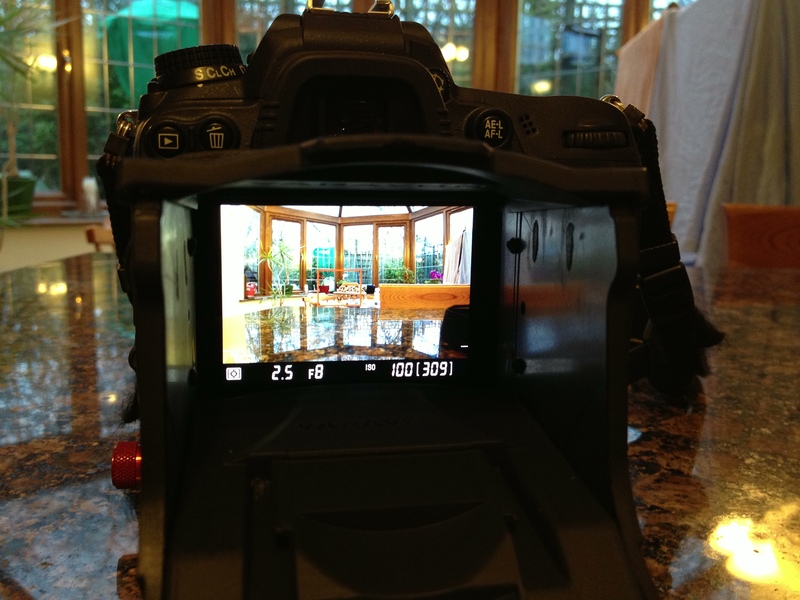 Use this view when you want to look direct into the camera and magnify your view of the LCD. The loupe is held in place with the lock/release button – shown here on the RHS just below the loupe itself. So, why use a loupe? Well, firstly, it can help block out light so you can see the LCD easier. Secondly it can act as a stabiliser, by providing contact with your head, the camera will have less shake when handholding. Lastly, the inbuilt dioptre can be used to adjust for any eyesight issues. These shots show how close the Multi Fnder sits to the D7000’s back buttons. The finder needs to sit as left as possible – to give you a chance to press the left hand side of the D button (surrounding the OK button) located on the right hand side. As long as you can just press the buttons on the left hand side – your ok.
VARAVON’s Follow Focus was supplied as a “freebie” extra. 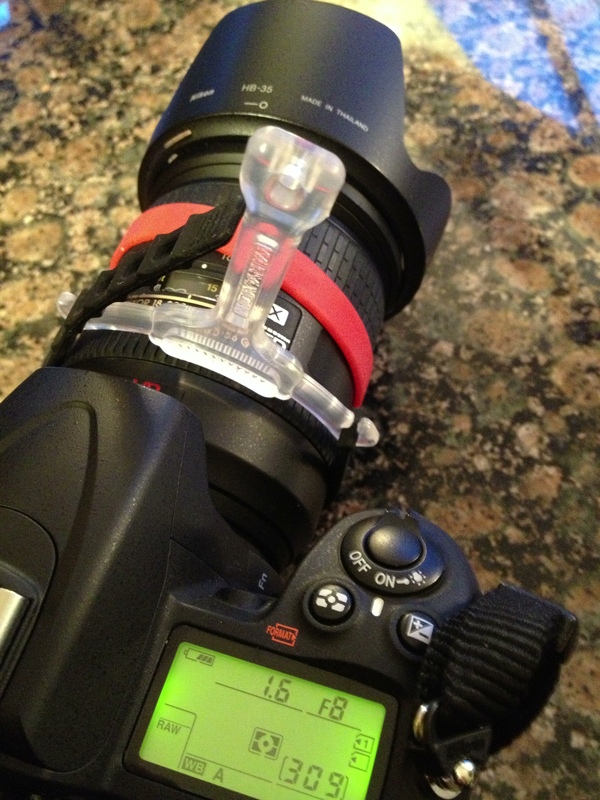 This little device wraps around the focus ring and enables easier focussing because you simply move the lever. 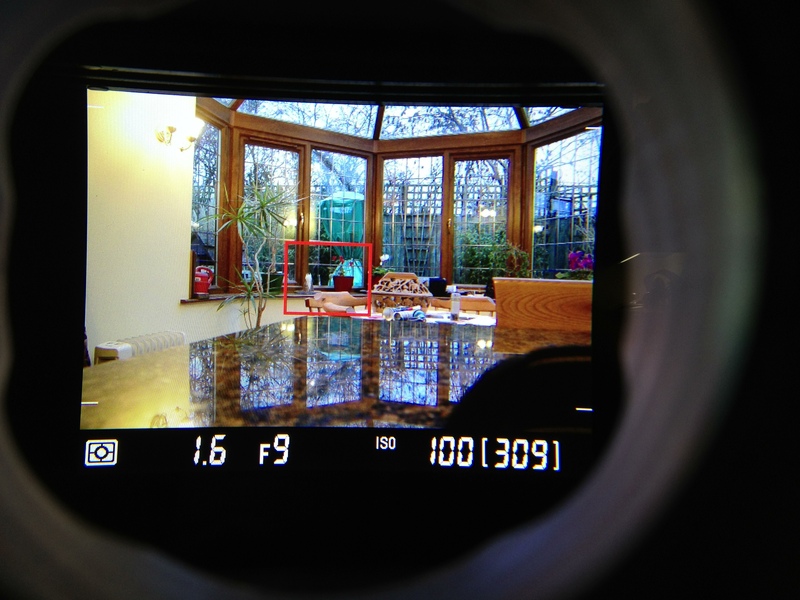 Apart from being easier to adjust, you can also use this device to your advantage with pre-focussing. Say you want to adjust focus during one take. 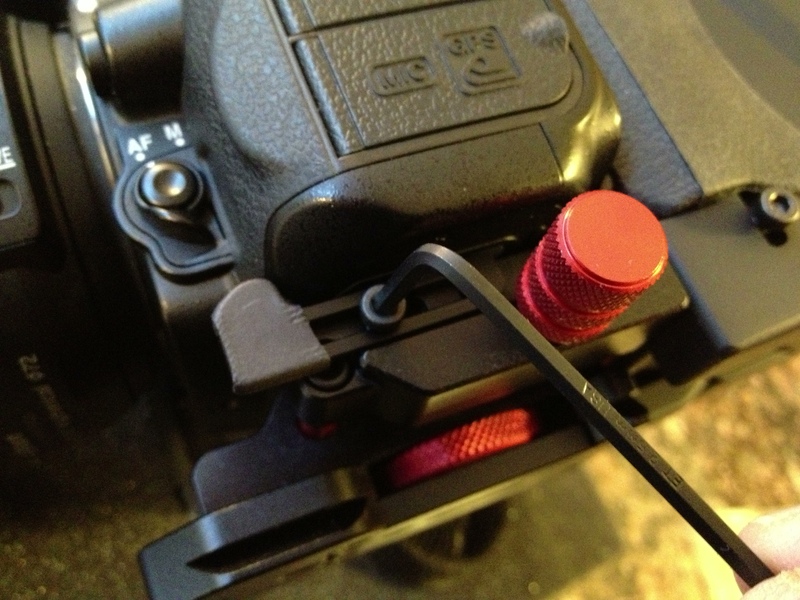 If you’ve determined the focus point for your second shot, simply take note of the angle of the follow focus lever. Then, during the shot, simply slowly move the lever at the desired time to the pre-noted angle point. That’s all you’ll need to do. This is useful if you have a very narrow depth of field and want to change focus point from say one person or object to another. There’s an old adage that you always get what you pay for. This couldn’t be more true here. The Multi-Finder isn’t the cheapest on the market, but it is a quality item that has many features. Build quality is better than some others I’ve looked at, the mirror and loupe quality are great too. For those intending on possibly upgrading camera one day, or even having multiple cameras this is a great choice. If you think you’re going to stay with a D7000 and never have a 3.5″ LCD screen then maybe the Pro Finder might be a better choice due to the tight fit around the rear buttons. Would you like to learn more about loupes? What shutter speed is best for movies? What other devices/accessories can help? I cover all theese things and a whole lot more, in “How to shoot movies with your Nikon D7000“. This PDF covers; white balance, focussing, shutter speed, aperture, ISO, loupes, tripods, ND filters and more.